There are a variety of elements that make up the 2040 RTP, including the 2040 Regional Transit Element (RTE), the 2015 Congestion Management Process (CMP), and the 2013 NFRMPO Bike Plan. Additionally, Environmental Justice (EJ) and Environmental Mitigation (EM) analyses were conducted to ensure no single group or environmental feature was negatively impacted more than another. To avoid, minimize, or mitigate disproportionately high and adverse human health and environmental effects, including social and economic effects, on minority and low-income populations in relation to transportation improvements. Denial of, reduction in, or significant delay in the receipt of benefits of DOT programs, policies, or activities. Suffered by the minority and/or low-income population and is appreciably more severe or greater in magnitude than the adverse effect that will be suffered by the non-minority and/or non-low-income populations. 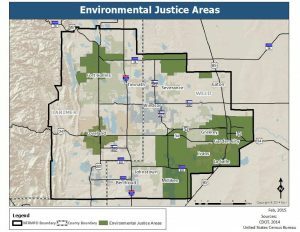 It is important to identify where significant numbers of minority and low-income households are located within the region to comply with the requirements of Executive Order 12898, Federal Actions to Address Environmental Justice in Minority and Low-Income Populations, and DOT Order 5610.2(a). These orders were enacted to ensure the full and fair participation of potentially affected communities in transportation decisions. The intent of EJ is to avoid, minimize, or mitigate disproportionately high and adverse impacts on minority populations and low-income populations. 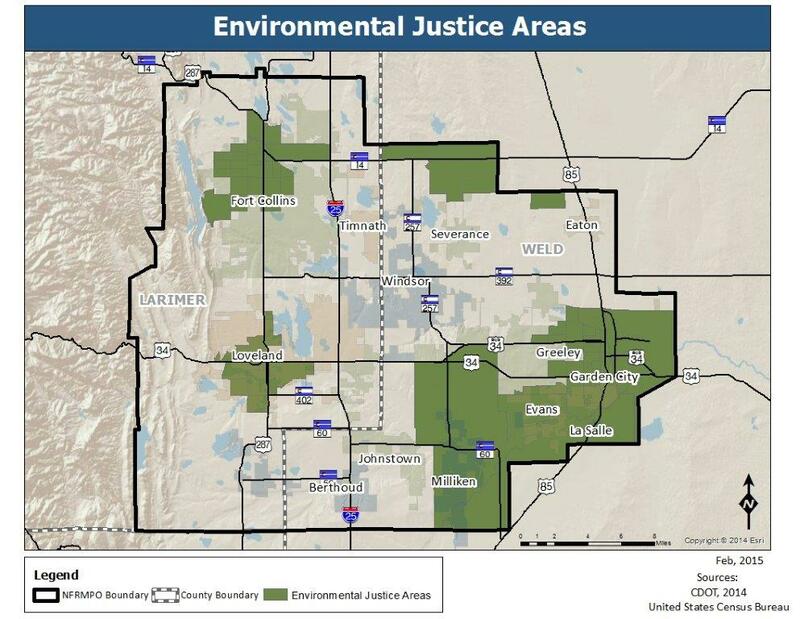 The NFRMPO uses CDOT’s Environmental Justice in Colorado’s Statewide and Regional Planning Process Guidebook, as the framework for addressing EJ in the region. Much progress has been made in mitigating transportation’s effects on the environment. According to 23 CFR §450.104, environmental mitigation activities are “policies, programs, actions, and activities that, over time, will serve to avoid, minimize, or compensate for (by replacing or providing substitute resources) the impacts to or disruption of elements of the human and natural environment associated with the implementation of a long-range statewide transportation plan or metropolitan transportation plan.” Mitigation efforts should benefit neighborhoods and communities, cultural resources, parks and recreation areas, wetlands, water sources, natural areas, endangered and threatened species, and the ambient air. Project impacts are considered in the planning phase rather than after the project finishes. Regional and statewide mitigation efforts have been discussed throughout this chapter. CDOT programs are aimed at improving air and water quality, preserving the delicate ecosystem of Eastern Colorado via the SGPI, and moving toward sustainable and cleaner energy production. All of these mitigation efforts are in line with CDOT’s Statewide Transportation Plan and policies set and enforced by CDPHE. Mitigation for disruption to the human environment is addressed in Environmental Justice. Projects that meet federal agency’s criteria for no significant environmental impact may be excluded from further NEPA examination. The EA is a report which determines whether a project significantly impact the environment. If the project will not significantly affect the environment, then the agency issues a finding of no significant impact or FONSI. An EIS is prepared when a noteworthy impact is expected to significantly impact the environment. The EIS considers alternatives and proposed actions. Outreach must be provided. Colorado enforces federal requirements for environmental mitigation, specifically for air quality and the environment. CDPHE works alongside the EPA to enforce the federal EAs and EISs. CDPHE is also the lead for air quality regulations for the State and local agencies in Colorado, including the NFRMPO.